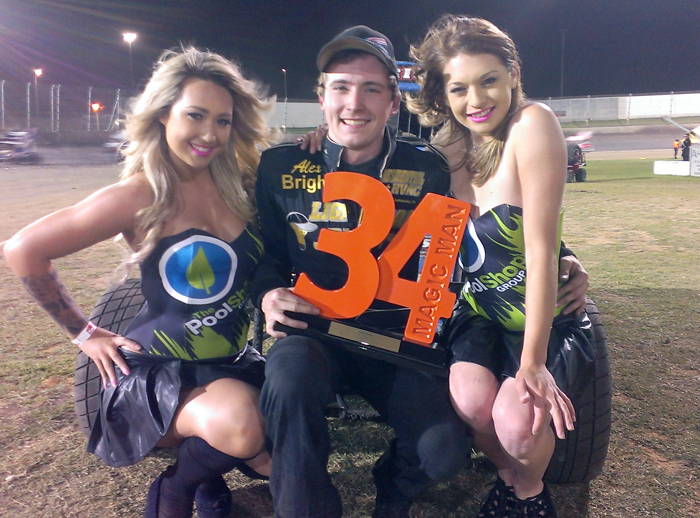 Bright sparkles with Magic Man 34 win at Perth Motorplex | Talking Speedway, Speedway news from around the world! 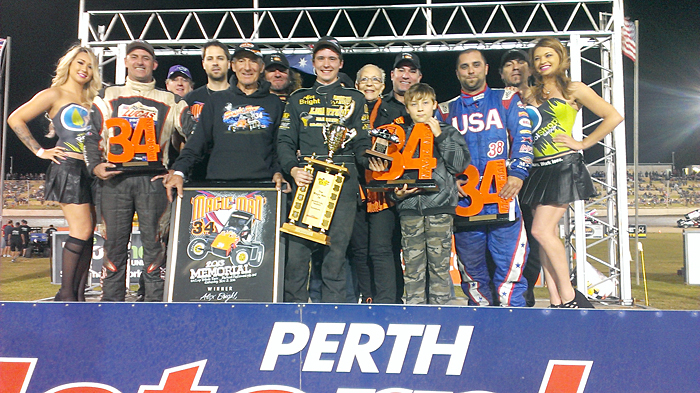 Bright “Sparkles” with surprise win in the Magic Man 34 Tribute Feature at the Perth Motorplex. The Magic man 34 Tribute Feature was run in conjunction with the inaugural Speedcar Pro Series. The race run over the Magic Number 34 laps was a fitting tribute to the late 4 Times Australian Champion Michael Figliomeni. The field was impressive Alex Bright, Davey Ray the four times defending Champion fellow Americans Casey Shuman and Steve Buckwater were joined by New Zealand’s Michael Pickens as well as many of Australia’s leading drivers. Adam Clarke possibly Australia’s best started the night in sizzling form when he set the fast time and won the “Top7 “ Shoot out for pole . Adam Clarke had problems during the race and was out after 24 laps. The defending Champion Ray started the race from position 6 and looked likely to score his 5th win in this special race. Bright driving the Jack Berry owned Polar Ice entry raced Ray throughout the race exchanging slide jobs on the defending Champ as the pair worked vigorously for the race lead. 7 Laps out from the finish Davey Ray had to withdraw leaving Bright to hold off the late race challenge from Casey Shuman. The prestige of the Magic Man 34 Title after 34 of the most special laps in Australian Speedway was in the hands of the 23 year old from Collegeville Pennsylvania. Casey Shuman was second with Sydney driver Mark brown third. New Zealand’s Michael Pickens damaged his race engine and missed the Feature while Australian Champ Neville Lance and American Steve Buckwater would prefer to forget their nights . Victorian Travis “Squizzy “ Mills overcame some early night wiring problems that threaten his night when he raced home for a well deserved 6th place . 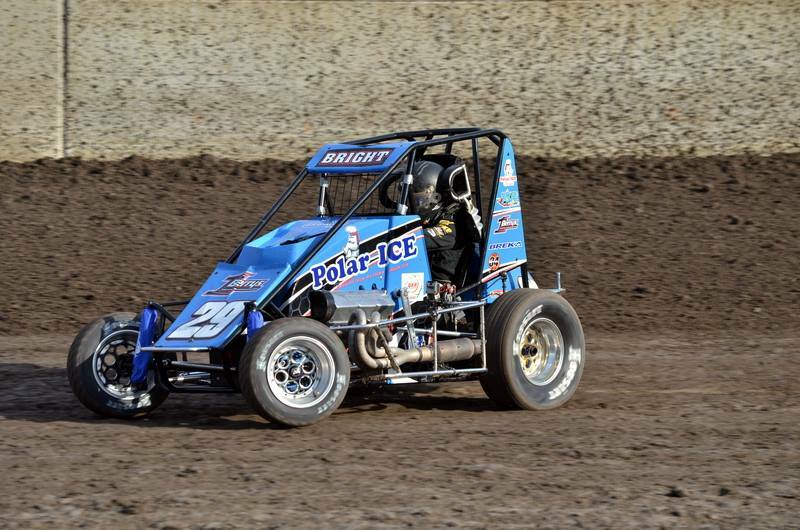 While Alex Bright the ARDC Midget driver might have been a surprise winner in the eyes of many he had to respond many times to the Davey Ray challenges during the race, outside passes and nicely timed moves in the traffic were a delight to see. I couldn’t be happier,” Bright said. He said it was a long journey but well worth it “to work with a great group of guys and an awesome car”. Bright didn’t think he was going to win but said his confidence peaked after the pole dash. Casey Shuman“I had planned on maybe seeing a lot more yellows and was trying to conserve on tyres a little bit,” Shuman said. “I didn’t quite play in our hands. Shuman has only contested the race twice and paid tribute to the Figliomeni family and event organisers. “It was tough work..it was just hammer down,” Brown said. Heat 1: 1st Davey Ray, 2nd Mark Brown, 3rd Alfonso Guadagnino, 4th Adam Clarke, 5th Steve Buckwalter, 6th Daryl Clayden, 7th Andy Pearce. DNF: Brock Hallett, Travis Mills and Bob Goddard. 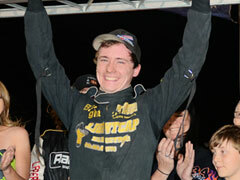 Heat 2: 1st Matt Smith, 2nd Scott Glazebrook, 3rd Casey Shuman, 4th Jack Alfirevich, 5th Daniel Golding, 6th Blake Mills. DNF: Neville Lance, Dayne Kingshott and Chris Telenta. Heat 3: 1st Lee Redmond, 2nd Paul Robinson, 3rd Vaughan Manders, 4th Troy Jordan, 5th Alex Bright, 6th Todd Bennett, 7th Rob Golding, 8th Karl Prall. DNS: Michael Pickens. Heat 4: 1st Adam Clarke, 2nd Daryl Clayden, 3rd Dayne Kingshott, 4th Alfonso Guadagnino, 5th Mark Brown, 6th Matt Smith, 7th Steve Buckwalter, 8th Blake Mills, 9th Troy Jordan. DNF: Neville Lance. Heat 5: 1st Davey Ray, 2nd Lee Redmond, 3rd Vaugham Manders, 4th Karl Prall, 5th Troy Jordan. DNF: Rob Golding, Andy Pearce, Bob Goddard, Travis Mills. DNS: Brock Hallett. Heat 6: 1st Scott Glazebrook, 2nd Paul Robinson, 3rd Casey Shuman, 4th Alex Bright, 5th Jack Alfirevich, 6th Daniel Golding, 7th Todd Bennett. DNS: Michael Pickens and Chris Telenta. Feature: 1st Alex Bright, 2nd Casey Shuman, 3rd Mark Brown, 4th Scott Glazebrook, 5th Lee Redmond, 6th Travis Mills, 7th Matt Smith, 8th Paul Robinson, 9th Daryl Clayden, 10th Alfonso Guadagnino, 11th Andy Pearce, 12th Jack Alfirevich, 13th Blake Mills, 14th Daniel Golding, 15th Troy Jordan. DNF: Davey Ray, Dayne Kingshott, Adam Clarke, Neville Lance, Todd Bennett, Vaughan Manders, Chris Telenta, Karl Prall, Steve Buckwalter, Rob Golding. 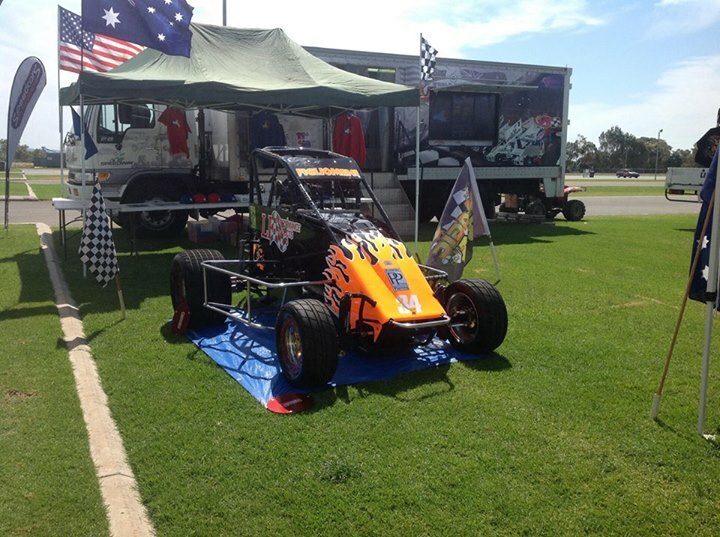 This entry was posted in Midget Speedcars, Speedcar Pro Series by admin. Bookmark the permalink.